Do you participate in the Elf on the Shelf tradition? 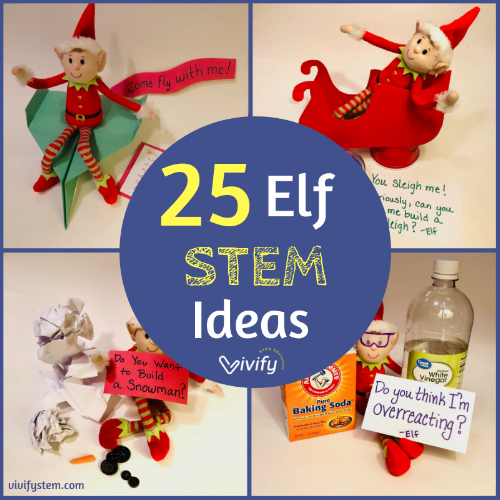 Take the Elf antics up a notch by adding some STEM flair. We have compiled a list of our favorite ways to both entertain and educate using Santa’s little helper. 1. The elf needs help building a tower of candy, toys, or blocks to reach a good place for it to sit and observe. Find the elf nearly buried beneath all of the building supplies. 2. Help the elf build a paper airplane to fly to the North Pole. Out of 3 different designs, which one flies the farthest? 3. Catch the elf trying to write a secret code in binary. Decipher what the elf is writing. You can use our free binary code resource here. 4. Dress the elf as an astronaut using foil, and print off paper with requirements to become an astronaut. Have kids research careers and education paths that would meet the requirements. 5. The elf wants to become a standard in measurement. Measure the height of your elf and use that to measure things like the kids’ heights and furniture. For example, the table may be 13 elves long. 6. Catch the elf with baking soda and vinegar. Encourage kids to experiment with the chemical reaction between the two ingredients. You can make a volcano erupt, add a bit of dish soap to the baking soda and build a snowman that you can “melt” with the vinegar, or add some food coloring for some fizzy color mixing! 7. Catch the elf hoarding cookies. Help the elf with his math skills in dividing the cookies equally between family members or classmates. You can read The Doorbell Rang by Pat Hutchins to go along with this one, and teach the elf about fractions or division. 8. The elf has a watch and a calculator and is trying to do some math, but needs help. Have kids help the elf calculate how long it will take to get to Santa Clause at the North Pole if the elf travels 80 mph (130 kph), 90 mph (145 kph), and 150 mph (240 kph) directly from where you live. STEM your Elf on the Shelf by helping him build a snowman. 9. Join the elf in trying to build a snowman with wads of paper. How tall can you make it without using tape? 10. Catch the elf with a CD or music player trying to learn how to dance. “Program” the elf to do a dance by giving it step by step commands like “left foot forward”, “hands above your head”. Tell the commands to a parent, sibling, or friend to test the code. 11. Create a rocket out of a cardboard tube and have the elf strapped on it. Build a stomp rocket launcher or buy this one that will launch the paper tube rocket into the air and see how high you can make it fly by changing things like the number and shape of the rocket fins! 12. Have the elf launching “snowballs” (marshmallows or cotton balls) using a catapult made of craft sticks, rubber bands, and an empty soda can. Challenge kids to launch marshmallows to hit a target using the one the elf made or by making their own. 13. Make a ski jump out of poster board with cardboard boxes for support. Show the elf crashed into a pile of cotton balls with candy canes as skis. Ask kids to see if they can make a toy car successfully use the ski jump to jump over an object so that the elf can see how it should be done. 14. Help the elf finish a bridge out of spaghetti to get across something! 15. Design a bell an elf has to ring to call the reindeer using a Makey Makey. 16. The elf needs help creating a drag device to retrieve presents that will come down the chimney. Have the elf waiting with string, coffee filters, tiny presents, and other materials that could be used. Starburst tied with a bow work well for tiny presents! Check out this drag device challenge to use in the classroom! 17. Catch the elf stuck up somewhere he/she can’t get down. Ask kids to build a grabber to grab the elf off the shelf (not knock him down, ouch!). See this Candy Grabber challenge for a similar activity. 18. Build a shelter for the elf to protect it from winter weather. Catch the elf with all of the building supplies collapse on top of him/her. Build a sleigh for your elf on the shelf and drive it using a robot like Sphero! 19. Using a Sphero robot, have kids make a sleigh that can carry the elf by controlling the robot. Solo cups work well to fit over the robot as a base for the vehicle. 20. Catch the elf wanting to travel across a full sink or bathtub, but realizing he/she cannot swim. Ask for kids to design and build a boat that can help the elf float across frigid waters. You can use this sailboat challenge for an indepth activity! 21. Help the elf build a device to protect an ornament that falls off of the tree. Catch the elf tangled in bubble wrap and cotton balls beneath the Christmas tree with a prompt that states he/she needs help with the task. 22. Use a stargazing app (like SkyView) with the elf to look at stars in the night sky. Use the outline of the elf to create an elf constellation on black paper with star stickers or white crayon marks as the stars. 23. Have the elf set up to complete the Zip Line Challenge. Build a device to help your elf slide down a zipline! 24. Complete the elf Sledding Adventure STEM Challenge. Can you create a vehicle to help the elf slide down a snowy slope? 25. Do the Elf Pendulum Challenge. Learn about simple pendulums and protect the elf and a candy cane as they smash into a wall on a candy cane pendulum. We love sharing ideas! Let us know what else you would add to this list. 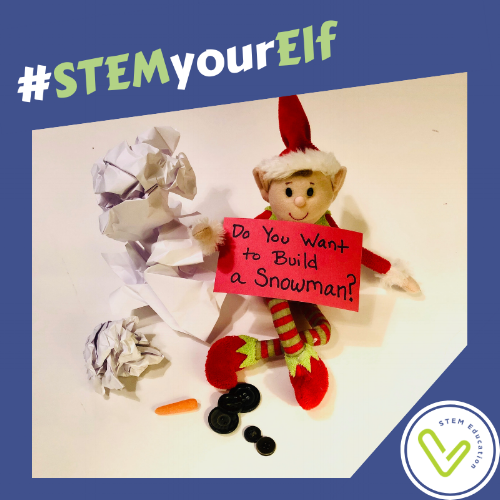 Use the hashtag #STEMyourElf to share your Elf’s STEM activities! STEM activity ideas to do with your elf on the shelf. **Vivify, LLC is a participant in the Amazon Services LLC Associates Program, an affiliate advertising program designed to provide a means for us to earn fees by linking to Amazon.com and affiliated sites. This post contains affiliate links.